Alstadsæter, A, N Johannesen and G Zucman (2017), “Tax evasion and inequality”, NBER Working Paper 23772. 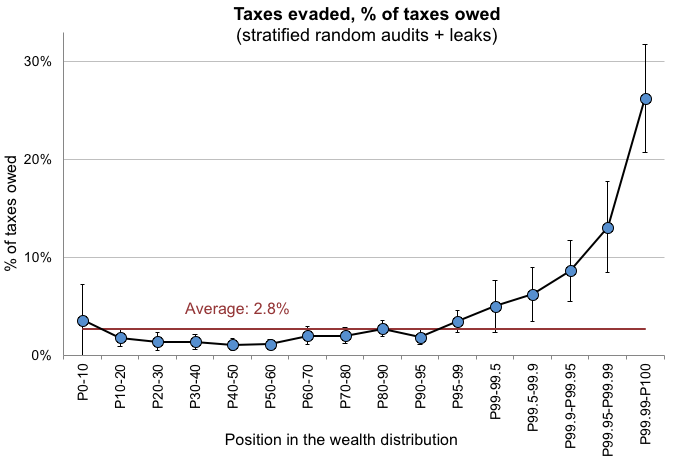 Alstadsæter, A, N Johannesen and G Zucman (2018), “Who owns the wealth in tax havens? Macro evidence and implications for global inequality”, Journal of Public Economics, forthcoming. Johannesen, N, P Langetieg, D Reck, M Risch and J Slemrod (2018), “Taxing hidden wealth: The consequences of U.S. enforcement initiatives on evasive foreign accounts”, NBER Working Paper 24366. Johannesen, N and G Zucman (2014), “The end of bank secrecy? An evaluation of the G20 tax haven crackdown”, American Economic Journal: Economic Policy 6(1): 65-91. Kleven, HJ, MB Knudsen, CT Kreiner, S Pedersen and E Saez (2011), “Unwilling or unable to cheat? Evidence from a tax audit experiment in Denmark,” Econometrica 79(3): 651-692. Piketty, T, E Saez and G Zucman(2018), “Distributional national accounts: Methods and estimates for the United States”, Quarterly Journal of Economics 133(2): 553-609. Zucman, G (2013), “The missing wealth of nations: Are Europe and the U.S. net debtors or net creditors?”, Quarterly Journal of Economics 128(3): 1321-1364. Zucman, G (2015), The Hidden Wealth of Nations: The Scourge of Tax Havens, University of Chicago Press.